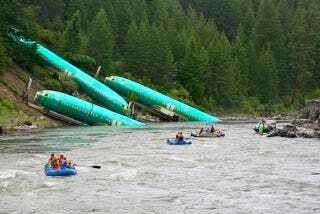 A trio of Boeing fuselages wound up in the Clark Fork River this week, when a train carrying the aircraft derailed near Superior, Montana. Thankfully, no one was injured – but we can't help but wonder what Boeing intends to do with these castoff parts. See more photos of the aftermath by Kyle Massick at King 5 News.